New site provides customized journey with dynamic features. 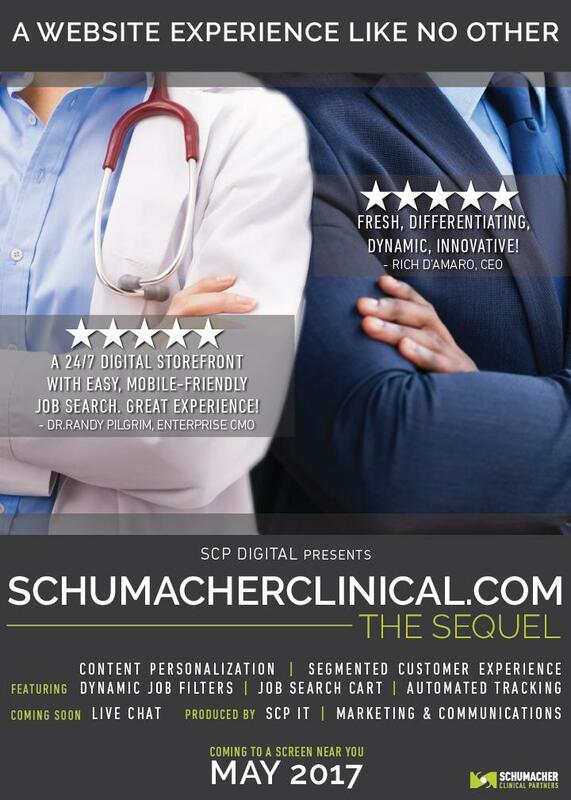 Schumacher Clinical Partners debuted a new and improved website this week, highlighting a dynamic user experience for the company’s two primary customers: healthcare providers and executives. Over 18 months in the making, the new site is a collaborative effort by SCP’s IT and Marketing departments, with agency HCB Health of Austin, TX at the forefront of research and strategy. The enhanced experience begins immediately upon entry to the site, where users choose a path customized to their preferred journey. Enhancements from the former site include personalized content for users, dynamic job postings now available for clinical candidates based on their interests and locations, and an easy-to-use job cart feature for prospects to save and return to preferred openings. The next phase of the site, expected later this year, will feature a live chat option for prospective clinicians to speak directly with recruiters. Click around to see the new features and functionality throughout the site. SCP recognized top performing medical leaders at the company’s Medical Leadership Conference in Orlando earlier this month. Schumacher Clinical Partners recognized top performing medical leaders at the company’s Medical Leadership Conference in Orlando earlier this month. The winners of the Top Performer award were nominated by key leaders within their Division of SCP. Through their leadership, the Top Performers produced and sustained an exemplary level of performance in their respective practices. “The recipients exemplify what our company goal of ‘Excel’ truly means – to improve the effectiveness of our clinical practices, to unify our greater organization, and to convert improvements into patient-centered results,” stated Dr. Randy Pilgrim Enterprise Chief Medical Officer for SCP, who recognized each with an exclusive lapel pin at the conference. “I was truly humbled and gratified to see how many earned this level of recognition, as indicated by both objective and subjective criteria. Congratulations to all of our Top Performers; we are proud of you, and grateful for your success." Christopher Edwards, DO, Mon General Hospital; Garrik Misenar, MD, Mountain States Health Alliance; Wajeeh Sana, MD, Oswego Hospital; Andrew Hughes, DO, OhioHealth Hardin Memorial Hospital; Premal Joshipura, MD, Advocate Condell Immediate Care Center - Gurnee-UC; Rick Harrelson, MD, Medical Center Enterprise; Kelly Abbrescia, DO, Bayhealth Medical Center; George Belkowski, MD, OSF St. Francis Hospital & Medical Group; April Bisaga, DO, IU Health LaPorte Hospital; Chris Novak, MD, Abrom Kaplan Memorial Hospital – Hospitalist; Jim Pruitt, MD, Fannin Regional Hospital; K. Scott Parks, MD, Opelousas General Health System; Moudar Alshazley, MD, Santa Rosa Medical Center; Gene Waldon, MD, Siloam Springs Regional Hospital; Chad Heinen, MD, St. Martin Hospital; Shoaib Arif, MD, Wuesthoff Medical Center - Melbourne; Churchill Akhigbe MD, Arkansas Methodist Medical Center; Kathleen Joseph-McBean, MD, Broward Health Coral Springs; James Crittenden, MD, Hancock Medical Center; Casey Prenger, MD, Harris Regional Hospital; Aftab Khan, MD, Illinois Valley Community Hospital; Anna Lim, MD, IU Health LaPorte Hospital; Amanda Lacomb, MD, Jennings American Legion Hospital; Joseph Dell'Aria, MD, Martin General Hospital; Damary Gonzalez, MD, South Texas Regional Medical Center; Rodd Hillard, MD, SSM Health St. Mary's Hospital - Jefferson City; Bentley Tate, MD, Colorado Plains Medical Center; Gerald Stell, MD, Minden Medical Center, Acadian Medical Center, a campus of Mercy Regional Medical Center; Allen Mosley, NP, Minden Medical Center; Michael Peebles, MD, Lafayette General Medical Center; Chris Lawrence, MD, Lafayette General Medical Center; Keely Mixon, PA, Lafayette General Medical Center; Laura Steines, MD, SSM Health St. Joseph Hospital - St. Charles; Robert Corley, MD, SSM Health St. Joseph Hospital - St. Charles; Kathleen Christlieb, PA, SSM Health St. Joseph Hospital - St. Charles; Matthew Bernard, MD, Touro Infirmary; Ryan Bird, MD, Touro Infirmary; Valarie Stevenson, NP, Touro Infirmary; Myriam Hutchinson, MD, Abbeville General Hospital; Dustin Guillotte, NP, Abbeville General Hospital; Scott Domingue, MD, Teche Regional Medical Center; Tara Lathrop, NP, Teche Regional Medical Center; Gregory Folkert, MD, SSM Health St. Joseph Hospital - Lake St. Louis; Mark Johnson, PA, SSM Health St. Joseph Hospital - Lake St. Louis; Alan Wilson, MD, Lake Regional Health System; Trevor Schuneman, Sr., PA, Lake Regional Health System; Delilah Skirlis-Zavala, MD, Abrom Kaplan Memorial Hospital; John Harris, MD, Alleghany Memorial Hospital; Daniel Firer, MD, Citizens Medical Center; David Stone, MD, Citizens Medical Center; Michelle Johnson, NP, Citizens Medical Center; Kevin Karam, MD, Lafayette General Medical Center - Southwest Campus; Melanie Fitzmorris, NP, Lafayette General Medical Center - Southwest Campus; Henry Dupre, MD, Mercy Regional Medical Center; Michael Morris, MD, Ochsner Medical Complex River Parishes; Blaine Lavergne , MD, St. Martin Hospital; Morris Sandler, MD, Tulane Lakeside Hospital; John Hall, MD, Woodland Heights Medical Center; Nwando Okafor, MD, Corpus Christi Medical Center-Doctor's Regional, Corpus Christi Medical Center-Northshore Emergency Center; Steven Kastl, DO, Corpus Christi Medical Center-Doctor's Regional, Corpus Christi Medical Center-Northshore Emergency Center, Corpus Christi Medical Center-Northwest Regional Campus; David Haman, DO, Edinburg Regional Medical Center - Main Campus; Joseph Guarisco, MD, Ochsner Baptist Medical Center, Ochsner Medical Center - North Shore; Scott Michaelson, DO, Ochsner Baptist Medical Center; Anuj Vohra, DO, Orange Regional Medical Center; Trevor McGinley, MD, Orange Regional Medical Center; Meena Moteelall, MD, Orange Regional Medical Center; Toni Eaton, PA, Orange Regional Medical Center; Christopher Schlanger, MD, SSM Health St. Clare Hospital – Fenton; Justin Rapoff, DO, SSM Health St. Clare Hospital – Fenton; Justin Moody, DO, SSM Health St. Clare Hospital – Fenton; Mindy Carney, PA, SSM Health St. Clare Hospital – Fenton; Jevin Bordelon, MD, Acadian Medical Center, a campus of Mercy Regional Medical Center; Sam Mansour, MD, Baptist Memorial Hospital – Booneville; Maurice Prince Jr., MD, Byrd Regional Hospital; Hoa Nguyen, MD, Glenwood Regional Medical Center; Carlos Ramirez, MD, Rio Grande Regional Hospital 24 Hour Emergency Care – Edinburg, Rio Grande Regional Hospital 24 Hour Emergency Care – McAllen; Scott Dudley, DO, SSM Health St. Mary's Hospital – Audrain; Phillip Chapa, MD, Wise Health System – Main Campus; Traci Lawler-Shortt, NP, Wise Health System – Main Campus; Gene Floyd, MD, Abbeville Area Medical Center; Allen Fisher, DO, Bartow Regional Medical Center; Jimmy Sellers, PA, Bartow Regional Medical Center; James Crowell III, MD, Baton Rouge General Medical Center – Bluebonnet; Kathleen Varnes, MD, Baton Rouge General Medical Center – Bluebonnet; John Jones, MD, Baton Rouge General Medical Center – Bluebonnet; Frank Guarisco, NP, Baton Rouge General Medical Center – Bluebonnet; Stephen Nichols, MD, Brownwood Regional Medical Center; Brandon Gilmore, DO, Brownwood Regional Medical Center; Nadim Islam, MD, Houston Methodist St. John Hospital; William Fisher, MD, Nathan Littauer Hospital & Nursing Home; Donald Maples Jr, DO, Northeast Regional Medical Center; John Seymour, MD, Ochsner Medical Center - North Shore; Patrick Masching, MD, Saint Anthony's Health Center; Rodger Hanko, MD, Saint Anthony's Health Center; Matthew Cary, NP, Saint Anthony's Health Center; Lee Freund, DO, SSM Health St. Joseph Hospital – Wentzville; Mark Swift, DO, Trumbull Memorial Hospital; Debra Hoplight, NP, Trumbull Memorial Hospital; Greta Parks-Herndon, MD, ETMC – Quitman; Terence Kolb, MD, Harris Regional Hospital; Andrea Jutte, NP, Harris Regional Hospital; Mark Murphy, MD, San Angelo Community Medical Center; Edward Wright, MD, South Texas Regional Medical Center; Murty Ganti, MD, Sunbury Community Hospital; Nathaniel Reinemeyer, MD, Adena Regional Medical Center; Amanda Jones, PA, Adena Regional Medical Center; Vic Fey, MD, AllianceHealth Clinton; Keegan Massey, MD, Corpus Christi Medical Center-Northwest Regional Campus; Pablo Lorenzo, MD, Fort Duncan Regional Medical Center; Jessika Schottelkotte, NP, Ochsner Medical Center – Kenner; Michael Oliver, DO, Purcell Municipal Hospital; Richard Moore, MD, Rio Grande Regional Hospital; Jacob Vigil, MD, The Medical Center of Southeast Texas – Victory Campus; Jay Edelberg, MD, University Health Conway; Robert Brown, NP, University Health Conway; Veronica Caudill-Engle, DO, Whitesburg ARH Hospital; William Stief, IV, MD, Big Bend Regional Medical Center; Kyle James, MD, Lake Area Medical Center; Melissa LeBrun, NP, Lake Area Medical Center; Sophenia Gay, MD, Oconee Regional Medical Center; Laura Cheshire, NP, Oconee Regional Medical Center; Christopher Matt, MD, Opelousas General Health System; Nicole Lafleur, MD, Opelousas General Health System; Kolleen Snyder, NP, Opelousas General Health System. SCP recognized twelve outstanding medical leaders at the company’s Medical Leadership Conference in Orlando last week, identifying these clinicians for excellence in their field. Schumacher Clinical Partners recognized twelve outstanding medical leaders at the company’s Medical Leadership Conference in Orlando last week, identifying these clinicians for excellence in their field. Nathaniel Reinemeyer, MD, Adena Regional Medical Center; Michael Peebles, MD, Lafayette General Medical Center; Chayne Fisher, DO, AllianceHealth Seminole; Danelle Richards, MD, Northwest Medical Center – Springdale; Joshua Puhr, MD, Mountain States Health Alliance; Hassan Barazi, MD, Wheeling Hospital – Hospitalist; Gehrig Harris, MD, Midtown Medical Center – Hospitalist; Gregory Zarcone, DO, Doctors Hospital of Laredo – Hospitalist; Mark Johnson, PA, SSM St. Joseph Hospital – Lake St. Louis; Amanda Jones-Humphrey, PA, Adena Regional Medical Center; Keely Mixon, PA, Lafayette General Medical Center; and Kathryn Simmons, NP, Abilene Regional Medical Center. Schumacher Clinical Partners (SCP) has announced four new WellnessWorks clients. Schumacher Clinical Partners (SCP) has announced four new WellnessWorks clients to include: Davis Regional Medical Center, Statesville, NC; Bay Medical Center Sacred Heart Health System, Panama City, FL; Cypress Pointe Hospital, Hammond, LA; and Minden Medical Center, Minden, LA. 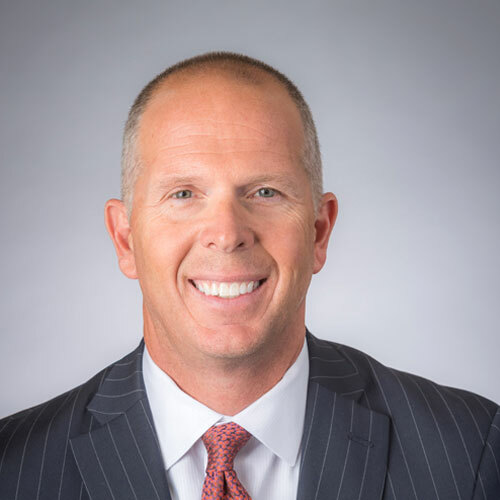 WellnessWorks, an SCP service line since 2012, is an offering that links the ongoing healthcare needs of employers, employees and their family members to providers, and is designed to give a coordinated approach in the delivery of healthcare services to an insured captive audience and the local community. Schumacher Clinical Partners (SCP) has announced four new WellnessWorks clients, to include: Frye Regional Medical Center in Hickory, NC; Hillcrest Hospital in Tulsa, OK; Abbeville Area Medical Center in Abbeville, SC; and Gerald Champion Regional Medical Center in Alamogordo, NM. WellnessWorks, a Schumacher Clinical Partners service line since 2012, is an offering that links the ongoing healthcare needs of employers, employees, and family members to providers, and is designed to bring a coordinated approach in the delivery of healthcare services to an insured captive audience. Denise Race, RN, BSN, MHA, Director of Operations Physician Practices/Orthopedics Program at Gerald Champion Regional Medical Center (GCRMC), stated that GCRMC decided to collaborate with Wellness Works in order to provide a more diverse and essential service to the citizens of the community and to their employers within the community. “By partnering with WellnessWorks, it is the belief of GCRMC that we will be able to fulfill our mission statement ‘to be the organization where patients choose to come, physicians want to practice, and people want to work,’” explained Race. The SCP WellnessWorks division also provides physician referral line services to more than 30 markets, as well as strategic ED Patient Navigation services customized to individual hospital needs.